An unnamed Vietnamese from the Ho Chi Minh has won an auction claiming his American dream. 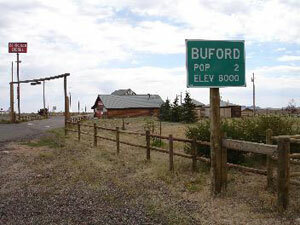 He now owns not just a piece of property but a small town called Buford in the United States. According to reports and the official auction site Williams&Williams, the Vietnamese bid for the town of Buford for $900,000 and won. According to his real estate broker in the U.S., this comprises his life’s savings and it was his first time to come to America when he claimed the title to this newly acquired property. Although classified a town sitting on 10 acres of land with its own postal code 82052, Buford has a lone resident, American war veteran Don Simmons, who has lived there for 30 years. After his wife died, Mr. Simmons decided to sell out to live closer to his son. The auction held live and online early this week drew bidders from 46 countries, but the Vietnam national bested all bids, which started at $100,000. He personally went to the auction, his first time to set foot in America. The property he purchased in the state of Wyoming will include a 3-bedroom modular home purchased new in 1994; a former school house built in 1905 transformed to an office; a garage built in 1895 and a 1900s cabin changed into a tool shed.